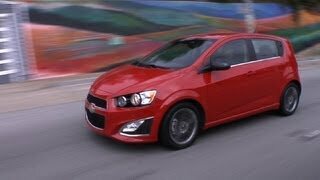 A hotter Chevrolet Sonic (called Aveo outside America) is about to sound off. 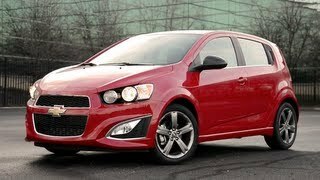 The Chevrolet Sonic RS 2013 goes on sale in the U.S.A. in late 2012, after making its public debut at the Detroit Auto Show Jan. 14-22. The new RS amplifies the Sonic’s youthful style and driving experience with unique exterior and interior features matched with a 138-horsepower (103 kW) Ecotec 1.4L turbo engine. 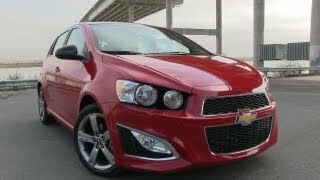 Sonic is the only vehicle in its segment to offer a turbocharged powertrain in the U.S.A.
DETROIT – A hotter Chevrolet Sonic (called Aveo outside America) is about to sound off – the 2013 Sonic RS. It goes on sale in the U.S.A. in late 2012, after making its public debut at the North American International Auto Show Jan. 14-22. The new RS amplifies the Sonic’s youthful style and driving experience with unique exterior and interior features matched with a 138-horsepower (103 kW) Ecotec 1.4L turbo engine. 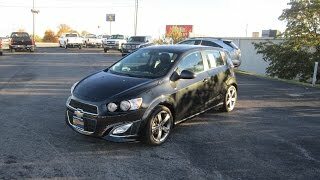 Sonic is the only vehicle in its segment to offer a turbocharged powertrain in the U.S.A. The Sonic RS is offered exclusively in the five-door body style. Chevrolet’s exclusive MyLink infotainment system is standard. It enables navigation directions downloaded through a smart phone to be shown on the radio’s large display, and offers the personalized connectivity of Pandora and Stitcher Internet radio. The more-aggressive look of the Sonic RS is inspired by the concept that debuted in Detroit in 2010. The Sonic RS will be available in Victory Red, Summit White, Cyber Gray Metallic and Black Granite Metallic, which is a new exterior color for the 2013 Sonic. One of the most-dramatic cues from the concept carried into the production model is the Sonic RS’s front fascia, which has a deep air dam design that enhances the car’s road-hugging stance. Vertical intakes at the edges of the fascia reinforce the wide, low proportion and house the fog lamps. RS-specific interior trim color for the instrument panel and door trim inserts. 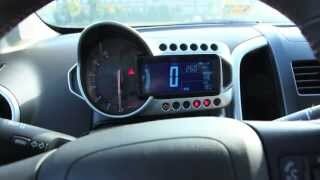 The Sonic RS’s interior is a connected environment, with the Chevrolet MyLink infotainment seven-inch color touch screen radio. This system allows customers to bring customized music libraries into the vehicle and use their smart phones and Bluetooth connectivity to access Pandora and Stitcher Internet radio and navigation. Navigation directions downloaded through a smart phone can be displayed on the screen and, when the vehicle is stopped, users can project video and even personal photo albums onto the screen from their phone. The Sonic RS is powered by a standard Ecotec 1.4L turbo engine that is rated at 138 horsepower (103 kW) and 148 lb.-ft. of torque (200 Nm) – and provides an immediate feeling of power that is sustained across the rpm band, for a greater feeling of performance at lower rpm. It’s matched with a six-speed manual transmission or six-speed automatic. Unique gear ratios for the six-speed manual transmission and unique final drive ratio for the automatic give the Sonic RS a sportier feel than non-RS models. Complementing the segment-exclusive turbocharged powertrain is MacPherson strut front suspension with coil springs and stabilizer bar, and a semi-independent, torsion beam axle-mount compound link-type rear suspension – featuring a robust, tubular V-shape beam – with gas-charged shocks. The front and rear tracks are identical at 59.4 inches (1,509 mm), for well-planted stability and balance. Electric power steering is standard and features a wear compensator that continually adjusts the system interaction with the steering gear to ensure precise steering action over the life of the system. Ten standard air bags, anti-lock brakes, electronic brake force distribution, brake assist and OnStar with Automatic Crash Response. Sonic is built at the General Motors’ Orion Assembly Center in Michigan, which received a $545-million investment in upgrades and retooling and helped restore approximately 1,000 jobs in the metropolitan Detroit area.